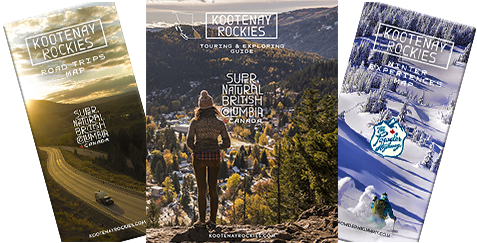 The arts and culture scene in the Kootenay Rockies is vibrant, to say the least. Eclectic art galleries, one-of-a-kind studios, museums, Victorian-era architecture and festivals including music, food and crafts are constantly happening in the many quaint mountain towns that dot this area. Let's begin this tour in the town of Golden - surrounded by national parks, three mountain ranges and at the confluence of two historic rivers, located at the Highway junctions #1/95. The outdoor recreation, spectacular scenery and history in this mountain town will captivate you and keep you coming back. With such a vibrant history and culture background, it's no wonder Golden has so many fantastic places of interest. The Art Gallery of Golden displays the work of a variety of local artists, including wood turners, sculptural ceramic artists and painters - oil canvas, mountain-scapes, abstract expressions, mono and lino prints. Stroll along the Kicking Horse River Pedestrian Bridge which is the longest covered pedestrian bridge in Canada. During the summer, fantastic free concerts take place here suitable for the whole family. Also during the summer, a Farmers Market takes place on Wednesday and Saturday, downtown. You'll find locally grown goods, live music and artisan wares. The Golden Museum displays artifacts dating back to 1865 and offer self-guided walking tours, as well as guided walking tours at set times through the year of Golden's Residential Past, Historic Downtown Tour and the Cemetery Tour. Golden to Parson is 26 km / 16 mi south on Highway #95. Parson boasts the World’s Largest Paddle / Oar - Certified by the Guinness World Records. This is a beautiful spot for a picnic. Parson to Radium Hot Springs is 80 km / 50 mi further south on Highway #95. The village of Radium Hot Springs lies at the southern entrance to Kootenay National Park. The hot pool facilities are located in Sinclair Canyon, just a couple minutes inside the park boundary. Cultures in Contact, located at the Visitor Centre, offers a history and culture of the Ktunaxa Nation & Anatomy of Land exhibit. Music and Market on Main takes place during the summer, Fridays 4-9pm, next to the Visitor Centre. You'll enjoy the live music and market vendors. Radium Hot Springs to Invermere is 13 km / 8mi. Invermere on the Lake is a small, friendly town situated on the shores of one of the warmest lakes in the region. Spend the day at the beach but be sure to explore the impressive shops and artisan galleries downtown. Pynelogs Art Gallery features the work of local artisans and artists. It also offers a cafe and gift shop. The beautiful Pynelogs building is over 100 years old and is the primary venue for a variety of arts related events. Effusion Art Gallery & Glass Studio is a Canadian contemporary gallery representing artists from around the country. Their Summer Creative Series is popular - watch artists at work. The Windermere Valley Museum consists of 6 buildings furnished with pioneer artifacts and a fine old log CPR Station. Art Walk takes place from June to September. Stroll around town and visit participating galleries. A Farmers Market takes place Saturday mornings during the summer. You'll find freshly grown produce to artisan wares and entertainment. Pothole Park, on Main Street, displays a beautiful monument of Explorer David Thompson. Learn the history - he first visited this area in 1807. Invermere to Fairmont Hot Springs is 18 km / 11 mi. Fairmont Hot Springs offers a full-service resort with spa facilities, golf, adventure centre, lodge, RV accommodation and of course the wonderful mineral hot pool complex. Farimont to Ta Ta Creek is 72 km / 45 mi south on Highway #95. Ta Ta Creek to Kimberley is 27 km / 16 mi south on Highway #95A. The alpine city of Kimberley is set on the western slope of the valley with the Purcell and Rocky Mountains on either side. The former mining town has recreated itself as a wonderful destination complete with golf courses, ski resort and an underground railway that highlights the history of the Sullivan Mine. The Kimberley Nature Park is one of Canada's largest municipal parks and offers an extensive network of trails. An outstanding Farmers Market takes place from June to September on Thursday evenings. You'll find fresh food and crafts from local farmers and artisans, live music and delicious food. The heritage museum displays artifacts, photographs and changing displays that depict various aspects of early life including mining and skiing. The Kimberley Arts at Centre 64 is Kimberley's arts and culture centre featuring art exhibitions and live performances. Further south on Highway #95A, it is 27 km / 16 mi to Cranbrook. Cranbrook is the largest community in the region, the commercial centre for the valley and has one of the sunniest climates in Canada. The arrival of the railway put Cranbrook on the map and generated wealth that built the elegant homes of the Baker Hill district. The superb Cranbrook History Centre houses the Canadian Museum of Rail Travel, Cranbrook Archives, Royal Alexandra Hall and the Cranbrook Museum. See historic residences in the Baker Hill area dating from 1888 included in the City Heritage Tour. Key City Theatre is a world-class art gallery and performing arts venue. Sam Steele Days takes place each year on the third weekend in June. It is a city-wide festival celebrating history and arts & culture. The Cranbrook Farmers Market takes place throughout the whole year. During the summer, the timing is every Saturday, downtown. If you want to loop back to Golden again and spend some extra touring the Columbia Valley, stop in at Fort Steele Heritage Town. It's been a family favourite attraction for decades. You'll take a step back in time to the 1890s and experience life in the restored pioneer boomtown. Some of the Radium Woodcarver's interesting work. Explore the many galleries and shops in Invermere. Farmers Markets offer wonderful fresh produce.